Change amortization month. See results for any month. An entire year. 25 bonds. 100 bonds. 1000's of bonds. 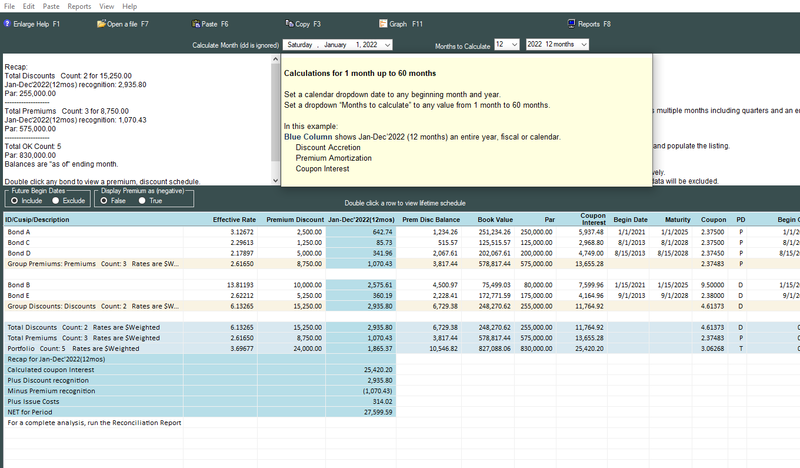 Set a dropdown "Number of months"
Calculate 1 month. A range of months. Entire calendar or fiscal year. Go back in time. Go forward and run projections. 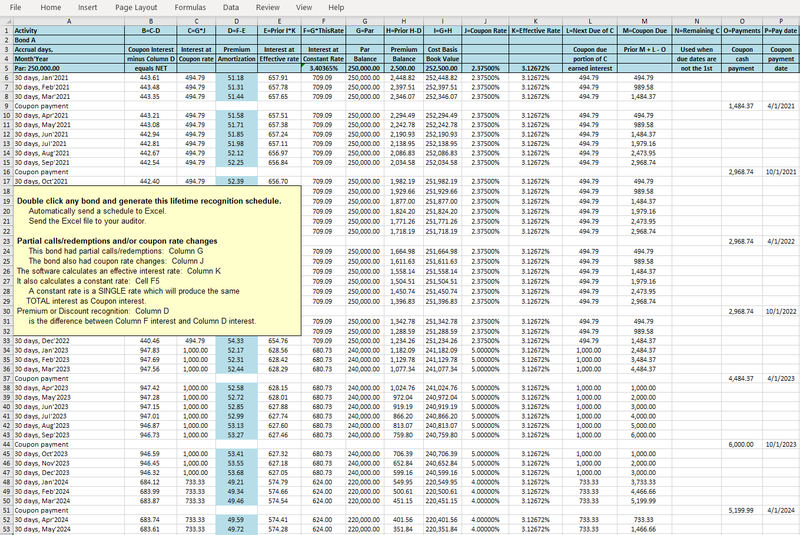 Export results to Excel. • Callable and non-callable. Partial and early calls/redemptions. • Fixed rate. Variable rate. Zero rate. Do a "save as" and create a new file each year, and then delete matured and sold bonds from the new file. Any prior or current month. Any prior or current year. 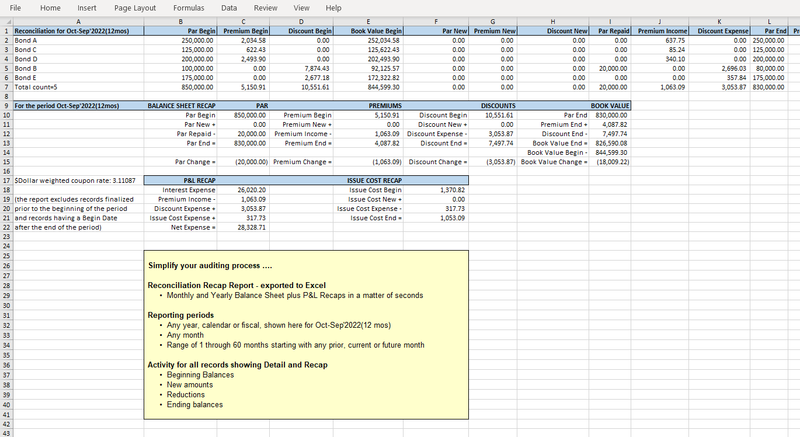 Generate issuance cost schedules, too. The software can begin amortizing current premium and discount balances. "I'm a partner in a small CPA firm. We were recently engaged to audit municipal bonds issued by a local agency. Bond discounts needed to be recalculated using the effective interest method. Calculations with annual reports had to be provided for each of the past seven years. I can't believe how easily your software allowed us to finish the entire job in such a short period of time." - Great at auditing time! 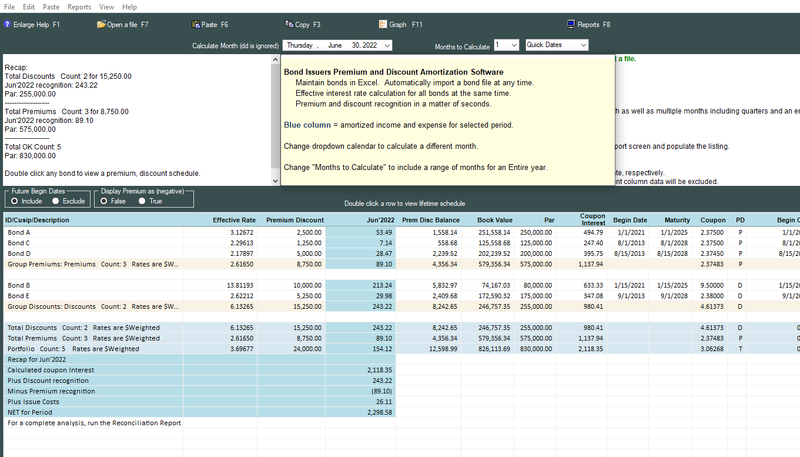 Our software accounts for bonds using the Accrual Method of accounting. Coupon interest is calculated monthly, when interest expense is incurred, regardless of when it is distributed. As such, our effective rate might differ from a cash basis YTM at the 5th to 6th decimal place. download a zip file containing the software and sample bonds.